Wheelchair Accessible Flights in Perris Valley at Sunrise Have you ever dreamed of flight but thought it was not possible because you are wheelchair bound or use a walker? Reach For The Stars has a custom built basket with a door that opens for easy access to the interior. We can accommodate a 36″ wide wheelchair*. The floor has a locking system to lock your chair into place. A drop down window allows a view from your seated position. The flights are available over Perris Valley at Sunrise, year round, weather permitting. Reservations are required. As a recognized non profit your tax deductible donation for a wheelchair or a regular passenger flight provides the much needed funding to bringing our specialized balloon to camps for adults and children with special needs. Our balloon has space for one chair and one or two guests, dependent on weight and outside temperature. 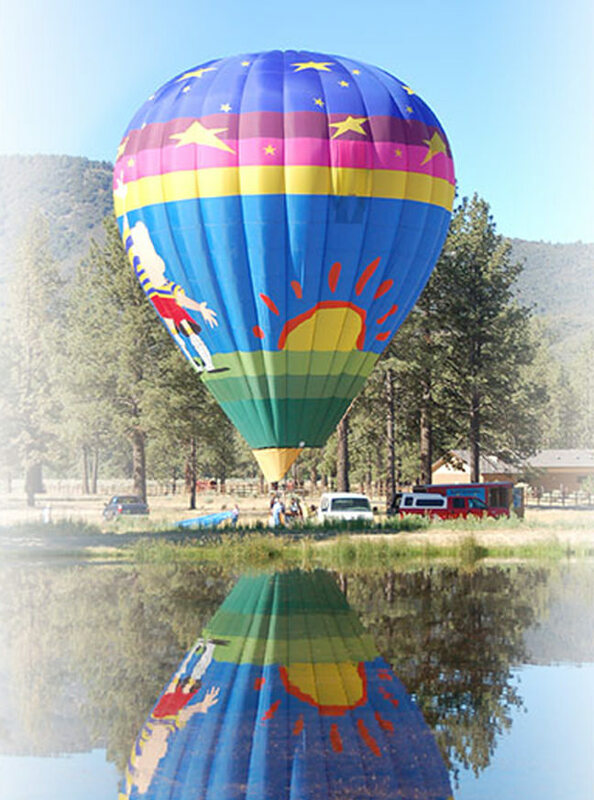 It is a private flight with only your party in the balloon plus our skilled pilot. The flight is approximately one hour in length. Our launch site selection is dictated by the individual needs of the passenger and their transport vehicle. In other words, we take off from the best accessible site and land in a site that is accessible to your transport vehicle. Our personalized flight for a donation $650 for the first two persons. Any additional person is $199 and is limited by weight. Your safety is our highest concern, so flights are weather permitting. We must have extremely calm conditions to accomplish the safest wheelchair flights. Our confirmation letter give you the details you need to know for your flight. If you are using a wheelchair, the brakes of your chair must be in working condition, as they are a part of the locking system used for your safety. Since each person’s needs are different, you must provide your own restraint to hold you in your chair upon landing. At Reach For The Stars we customize the package on your specific needs. For example, let us know if you prefer champagne or sparkling apple cider for your toast. Also, if there are any food allergies, we can modify the hors d'oeuvres to meet your specific diet needs. If you have questions on how we can personalize your package, please give us a call at 951-538-7368 or fill in the contact information below.